Local behemoths Amazon.com and Microsoft, as well as other tech firms that rent out computing power and storage, are rapidly becoming some of the biggest spenders in the corporate world, as they lay down the bases for a future in which most computing will take place in the so-called cloud. These companies are spending billions in acquiring or leasing the data centers that embody the cloud and employing the thousands of engineers that operate the new technology. The ramp-up was spurred by the widespread adoption of mobile computing, as smartphone and tablet-toting consumers wanted their data accessible from anywhere, including Netflix movies and music from Spotify. But it became massive when large companies started shunning their own server farms for those operated by tech giants, a phenomenon that took off a couple of years ago. “There’s tremendous demand,” says Scott Kessler, deputy global director for equity research at S&P Global Market Intelligence. And, he says, there are very few companies besides market-leading Amazon, Microsoft or Google with the pockets and the expertise to handle the huge outlays of capital and talent required. “They’re seizing upon what is really an opportunity that’s unique to the biggest and best-capitalized players,” Kessler said. In terms of the larger U.S. economy, the spending somewhat offsets a drop in investment by the energy and mining sectors now ravaged by cheap prices for energy. No company better exemplifies the rise in tech spending than Amazon, which reports first-quarter earnings Thursday. The company is a hybrid: its biggest business is retail, and a big part of its spending goes to new warehouses and devices as well as ambitious new ventures such as its own transportation and delivery network. But Amazon’s profits are increasingly dictated by cloud computing. So are its investments. Since 2010, the money it spends in technology and content has expanded sevenfold, to $12.5 billion last year. That’s a category that includes the cost of the equipment and salaries that underpin Amazon Web Services, its 10-year old cloud-computing unit. Amazon acknowledges in its annual report that infrastructure related to AWS has been a primary driver of spending in this segment. It’s a dramatic rise — the kind of money usually spent by the capital-intensive heavyweights that manufacture cars, start up remote mining facilities or drill oil wells a mile below sea level. 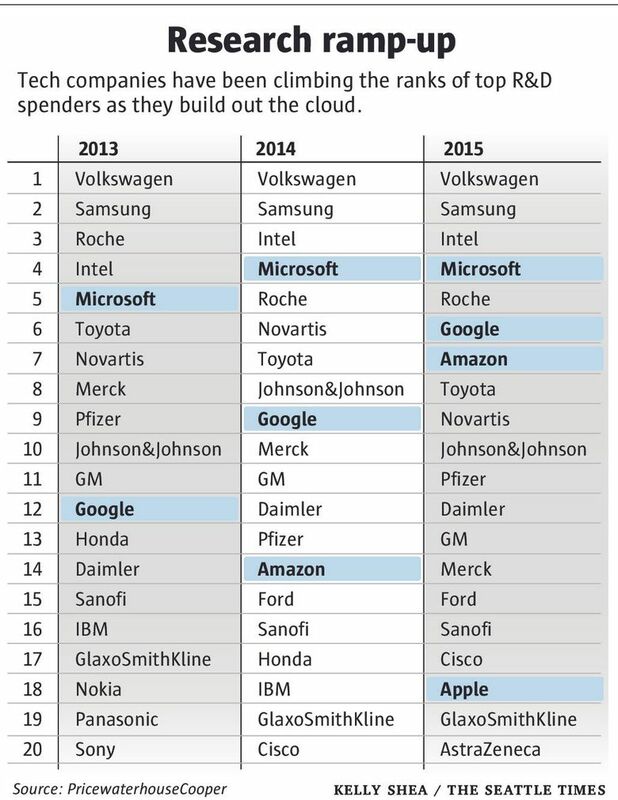 The increase, in 2014, suddenly put Amazon among the top 20 spenders in research and development, according to PricewaterhouseCoopers’ Strategy&, a consultancy. 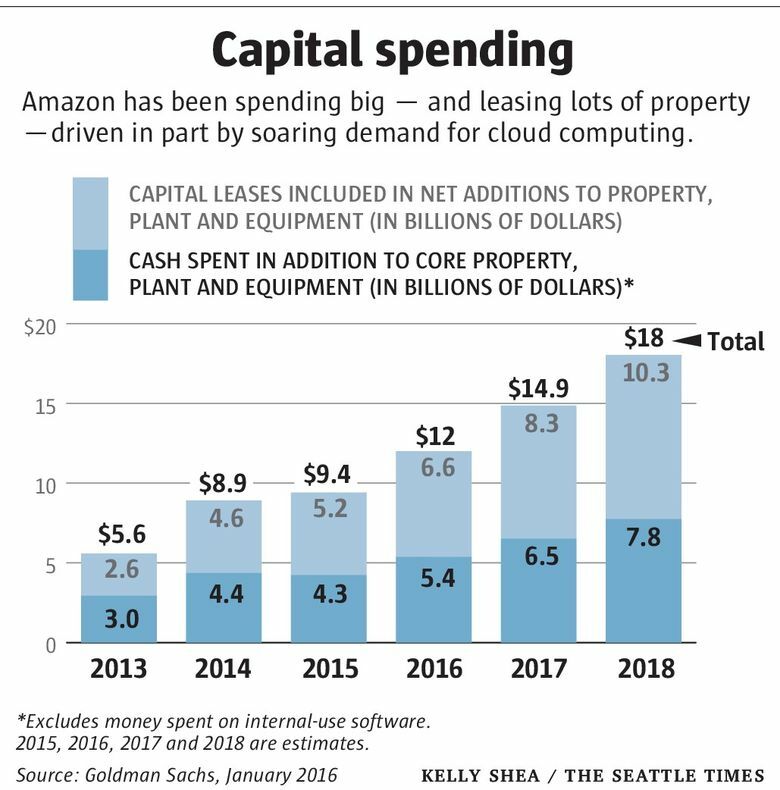 Another way of seeing how much Amazon is investing comes by counting its capital expenditures and lease financing of property and equipment. In 2015 the combination of purchases and capital leases was worth more than $9 billion, up from about $5.6 billion in 2013. Analysts with Goldman Sachs estimated last January that about two-thirds of the property and equipment that Amazon bought or leased in 2015 was dedicated to AWS. That was in part to set up new data centers around the world, but also to accommodate stronger demand among existing customers in regions already serviced by the company, Chief Financial Officer Brian Olsavsky said in a conference call last January. Goldman projected combined capital purchases and capital leases related to AWS to more than double to $12.5 billion in 2018, still accounting for two-thirds of all capital investment and leasing activity by the company. Microsoft realized later than Amazon the size of the opportunity in the business of cloud computing but has tried to make up for lost time. That’s meant spending a lot more cash on property and equipment than the software company was used to. In 2010, then-CEO Steve Ballmer said the Redmond company was betting its future on cloud computing. Microsoft has since staked that bet with billions of dollars building and leasing data centers from Germany to Quincy, Grant County, to Australia. One facility under construction in Virginia, targeting U.S. federal government business, will ultimately be more than a mile long. “We’re continuing to invest billions of dollars to build out infrastructure like this all over the world,” Scott Guthrie, who oversees Microsoft’s cloud and enterprise group, said at the company’s developer conference last month. Microsoft’s annual capital expenditures, which also include the value of capital leases, have tripled since Ballmer’s “all-in” speech, to $5.94 billion in the fiscal year ended last July. The increase, analysts say, is driven primarily by cloud-computing investments, and the company is on pace to exceed that total in its current fiscal year, which ends June 30, by about 20 percent. At the same time, Microsoft’s research and development budget has remained consistently near the top of global spending for more than a decade. It’s estimated to remain about $12 billion this year. Analysts with Goldman Sachs say cloud workloads, which represent about 5 percent of total computing, could triple over the next three years, turning it into an epoch-making hot spot, Goldman analyst Mark Delaney wrote in a note. Then again, the music can always stop for unforeseen reasons. Suresh Kotha, a professor of management at University of Washington’s Foster School of Business, points to the telecommunications bubble around the turn of the century. After investing massively in research and development and new fiber-optic infrastructure, fast-growing telecoms were loaded with debt after having overbuilt. It all ended in disaster, including the collapse of WorldCom in the wake of an accounting scandal. But there are differences, Kotha said. The cloud-investment ramp-up is restricted to a few companies, and most of the leading ones — Microsoft, Google and Apple — are sitting on many billions of dollars in cash. They also have a sense of what the size of the market opportunity is, he says. “They’re not chasing something that doesn’t exist,” Kotha said.